I attended a training session a few years ago where I heard Andrew Reece from InspectRealEstate presenting. He said: "The telephone isn’t a 50kg barbell." This resonated with me at the time, and now I find myself training on this but with my own twist, "There’s no emails in fruit." Most people who know me, know that I came from a fruit and vegetable background before I jumped into the trenches as an agent. While I owned a respectable family fruit market on the south coast of NSW, we never just got called by new coffee shops or restaurants that opened up, and I couldn’t just send them an email asking them to consider using our services either. I would visit the said business and order my lunch (more like coffee), ask to speak with the head chief or business owner, and ask them a couple of simple questions that would help me determine how I was going to win the business: "Hi George. 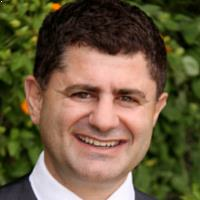 My name is Deniz Yusuf and I own Shoalhaven Fruit market, a family business just around the corner from here. Well done on starting up your business – we certainly needed a new coffee shop in the area. If you don’t mind me asking, who are you currently purchasing your fresh produce from? I know that if you were to purchase our produce, you’ll notice the difference in quality, and so too will your customers. We even deliver daily and purchase direct from local farmers, keeping local jobs and the community alive, only purchasing the best quality produce so it lasts longer for you, saving you more money in the long run." If you notice, I was selling the potential client of mine the points of differences our fruit market had over the supermarkets. Our business was like David, the small guy up against all odds (Goliath), so we had to provide quality in service and produce to win, and that we did. Now if we were to email the potential client, they MAY read the email, but they can hit 'delete' as there’s no emotion involved at all. If I called them it could create a chance to at least get the opportunity to pitch my offer, but going into the business made it far easier to win them over, as I could create a relationship easier and involve emotion. In real estate it’s not like you can walk into a business and ask for the listing, but if you’re following up clients from a previous call or appraisal, don’t email them asking for the business, as like Andrew said…"It’s not a 50kg bar bell" or as I train my clients, "There’s no emails in fruit" (well none when I was in the game). Be encouraged to know that you’ll win more business if you pick up the phone and ask for the business over sending them an email asking. Same goes with emailing a landlord asking them if you can get maintenance done on their property – they don’t check emails as often as you, so call them right away. This prevents tenants calling on the progress. So a couple of points made in this blog: don’t hide behind emails and try and win business, pick up the phone and create a relationship. Secondly, have your points of differences at hand, you never know when you’ll need them. Feel free to contact me if you need a hand in creating some ideal points of differences to help you win more business.